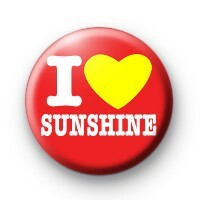 Bright I Love Sunshine badge in a great red colour with a massive yellow love heart and the text I Love Sunshine in white. Standard 25mm button badges made by hand in our family run workshop. If you would like a custom badge designing for you, please do get in touch.